When it comes to scenic hotels, there are very few that can compare with Bosworth Hall. Set within acres of beautiful countryside, in the heart of the East Midlands, the stunning building is like no other with its beautiful décor from inside to out. Bosworth Hall’s past is bursting with history and intriguing facts surrounding the Hall’s construction and takeovers which span the last five centuries. Bosworth Hall and Spa is situated in the rural town of Market Bosworth, Leicestershire, which has a population of just over 2000 residents. 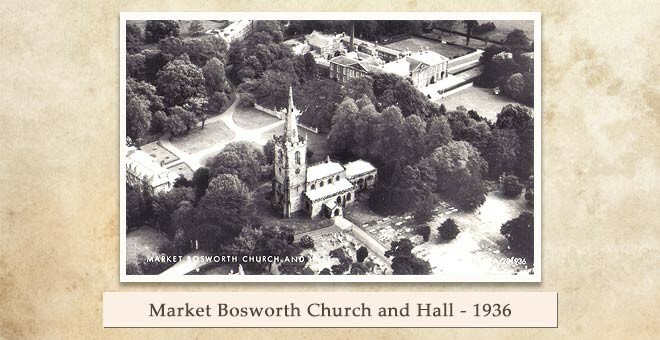 Market Bosworth is thought to have originated as an Anglo-Saxon village dating back to the 8th century. Yet one of the most prominent moments in its earlier years was of course the Battle of Bosworth, which took place to the south of the town in 1485 as the final battle between the House of Lancaster and the House of York. Market Bosworth is evidently full of history along with Bosworth Hall, a former stately home whose history will be expanded on below. 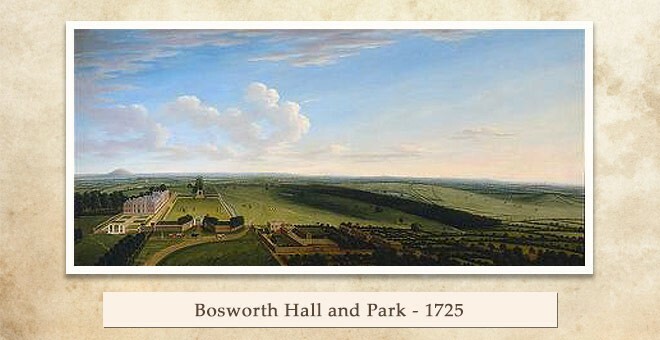 Bosworth Hall was not initially built as a hotel but instead served as a private home for the Dixie family, whose patriarchs held the title of Baronets of Bosworth in its early years. The grounds on which the hotels stands were first purchased by Wolston Dixie, Lord Mayor of London, in 1589. Bosworth Hall was not built until several years later, when the grounds had passed into the ownership of Sir Beaumont Dixie, a Baronet who was the builder of the Hall. The title of Baronet of Bosworth was created in later years, and given to the head of the Dixie family by King Charles II in 1660. It lasted for two centuries, with the title eventually ending with the death of Sir Wolston the 13th (the last Dixie Baronet) in 1875. It was reported that in the late 19th century, the Dixie household lost their fortune to gambling, which led to the reselling of the estate around the late 18th century. The southern view of Bosworth Hall is home to a Yew tree. In ancient times Yew trees were planted to guard cemeteries as it was widely believed that the Yew had powers to ward off evil spirits. This tree is considered to be the oldest in the estate and certainly one of the oldest in the surrounding area. It’s trunk measures 4.3m (taken 60cm above the ground), which using the guide for aging Yew trees of 1m equating to 100 years of growth, suggests an approximate age of up to 430 years. This must be taken as an approximate as the trunk is not uniformly circular. This then poses an interesting question as the southern wing of Bosworth Hall was rebuilt in 1670. Did the architect plant yew saplings in anticipation that 200/300 years later it would offer the view enjoyed today or did he make use of existing trees to frame the southern wing and lawn? Charles Tollemache-Scott, a deputy lieutenant, took over the estate around 1885 and wasted no time in conducting improvement work on the building after purchasing it from the Dixie clan. Many of the changes Tollemache-Scott made are still visible today at Bosworth Hall, including the monogrammed guttering and the former prison cell doors which replaced the previous gates in the cellar. Despite his renovations, Tollemache-Scott’s ownership was relatively short lived, as less than thirty years later the Bosworth estate was sold by his daughter in 1913. The property changed hands twice in the twenty years that followed, before eventually shifting to Leicestershire City Council in 1931. It was this change that would eventually enable the building to take on its new life, taking its first steps towards becoming the hotel that it is today. 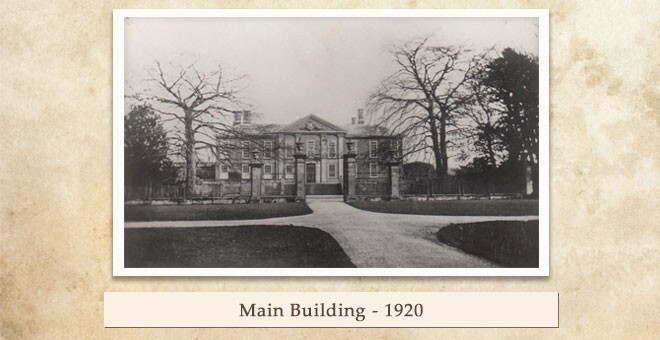 In 1936 and for the following twenty years, Bosworth Hall and adjacent grounds were used as a public hospital (the infirmary). 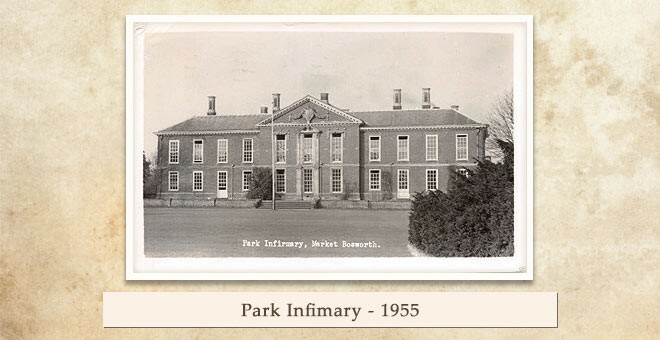 During World War II, the infirmary housed injured military personnel and went on to cater for long term patients up until 1957 when the hospital had to shut due to being short staffed. It wasn’t until the 1980s that it was eventually turned into a hotel, and even then, it was met with many bumps along the way. The firm originally hired to convert the Hall into a hotel went bankrupt before construction could properly begin. Due to this, Bosworth Hall was faced with the issue of becoming neglected and left as a derelict property. Nevertheless, Britannia Hotels made a successful bid, turning the stately home into both an impressive and charming hotel. Thanks to Britannia, Bosworth Hall still stands today and is one of the most extravagant hotels throughout our whole hotel chain. Britannia has been vigilant in keeping the building’s original features and lavish details intact, resulting in a hotel which perfectly combines a classic feel of a stately home mixed with a touch of modernism that appeals to our guests. The stunning architecture and rich history of Bosworth Hall aren’t the only selling points for this hotel in Market Bosworth. Like any quintessential British manor house, a ghostly guest is rumoured to haunt the halls. The spirit is known as ‘The Grey Lady’ and is rumoured to be the ghost of Anna Dixie, one of the daughters of the fourth Baronet of Bosworth, whose father accidentally murdered her while attempting to catch her lover. It has been recorded that his daughter Anne had fallen in love with the grounds gardener, much to his disapproval, and set a man-trap that, tragically, she fell into. The plan backfired and the Baronet injured his daughter disastrously, eventually leading to her death. The bloodstains caused by her wounds are rumoured to still be seen seeping through the wooden floor above the halls fireplace. Her ghost is said to roam the grounds looking for her long-lost lover, adding another intriguing layer to the history of Bosworth Hall. 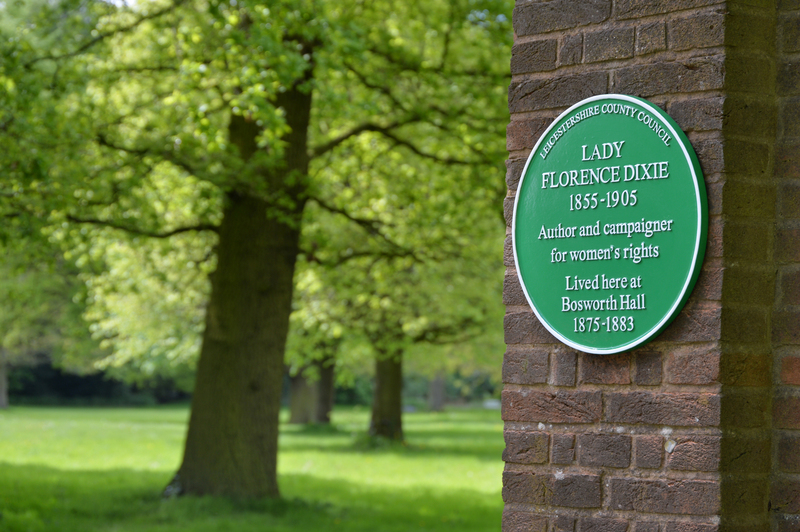 Bosworth Hall has recently become the proud owner of the Green Plaque in recognition of Lady Florence Dixie who lived at Bosworth Hall in the late 1800's. The commermorative plaque was put in place at Bosworth Hall by the Leicestershire County Council in July 2018. Lady Florence Dixie married Lord Alexander Beaumont Churchill Dixie in 1875 at the age of 19. 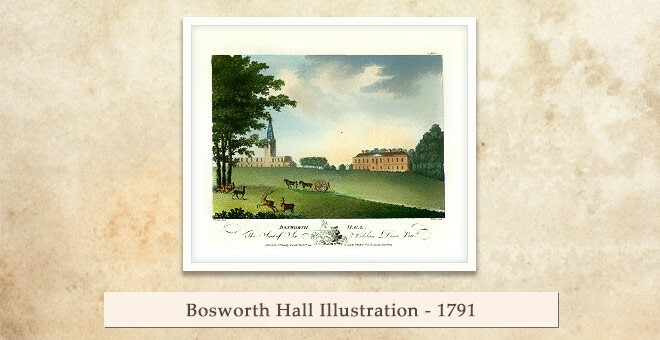 They went on to have two sons, and they lived happily on the Bosworth Hall estate in Market Bosworth. The family led an adventurous life together enjoying the outdoors, however, the family were forced to sell Alexander’s ancestral home in 1890 to pay off his gambling debts. Later on in life, in 1890, Lady Florence wrote “Gloriana or the Revolution of 1900” In a novel setting out emancipation arguments and predicted a woman prime minister before 1999. She also wrote about future changes for the UK, in that Scotland, Wales and Ireland would be devolved from England. Florence Dixie died aged 50 and was survived by two Great-granddaughters, Eleanor who resides in America and Caroline who lives locally. Bosworth Hall, has now become a tourism ambassador and member of the Bosworth Tourism Association. This newly formed Association ( 2017 ) is a developing group for businesses in Market Bosworth and surrounding areas. The group is focussed on rural tourism, retail or hospitality businesses. An important aspect of the group is to provide a supportive Network and Cohesive spirit between local tourism businesses.